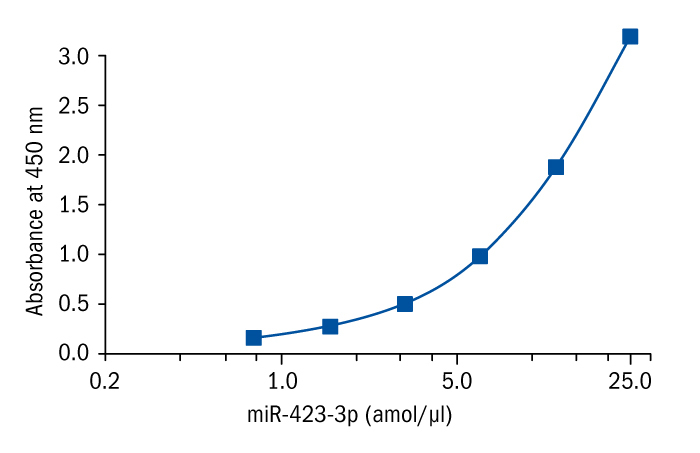 miR-423 gene is located in frequently amplified region of the chromosome 17q11.2 and can produce two mature sequences: miR-423-3p and miR-423-5p. miR-423-3p is expressed in human promyelocytic leukemia cells (HL-60) and has been reported to act as an oncogene via promoting cell proliferation, cell cycle progression, clonogenicity, cell migration and invasion. The expression level of miR-423-3p has been observed to be increased in multiple cancer types, including breast cancer, hepatocellular carcinoma, endometrial carcinoma, and head and neck squamous cell carcinomas. Recent study also confirmed higher levels of several miRNAs including miR-423-3p in lung cancer samples in contrast with healthy controls. Thus, miR-423-3p has the potential to become a useful oncological biomarker. Altered expression of miR-423-3p has been found in the kidney tissue, blood or urine of renal allograft recipients with acute rejection and fibrosis. miR-423-3p is involved in epithelial-mesenchymal transition signalling pathways promoting renal fibrosis. LIN, Jun, et al. MicroRNA-423 promotes cell growth and regulates G 1/S transition by targeting p21Cip1/Waf1 in hepatocellular carcinoma. Carcinogenesis, 2011, 32.11: 1641-1647. LI, Hong-tao, et al. MiR-423-3p enhances cell growth through inhibition of p21Cip1/Waf1 in colorectal cancer. Cellular physiology and biochemistry, 2015, 37.3: 1044-1054. ARRIOLA, Edurne, et al. Genomic analysis of the HER2/TOP2A amplicon in breast cancer and breast cancer cell lines. Laboratory investigation, 2008, 88.5: 491. FARAZI, Thalia A., et al. MicroRNA sequence and expression analysis in breast tumors by deep sequencing. Cancer research, 2011, canres. 0608.2011. BOREN, Todd, et al. MicroRNAs and their target messenger RNAs associated with endometrial carcinogenesis. Gynecologic oncology, 2008, 110.2: 206-215. HUI, Angela BY, et al. Comprehensive MicroRNA profiling for head and neck squamous cell carcinomas. Clinical cancer research, 2010, 16.4: 1129-1139. ZHU, Ying, et al. Identification of a serum microRNA expression signature for detection of lung cancer, involving miR-23b, miR-221, miR-148b and miR-423-3p. Lung Cancer, 2017, 114: 6-11. BEN-DOV, Iddo Z., et al. MicroRNA sequence profiles of human kidney allografts with or without tubulointerstitial fibrosis. Transplantation, 2012, 94.11.